Periodontal (gum) disease is a serious threat to the health of the gums and teeth. If left untreated, gum disease can destroy the structures that hold the teeth in place, in turn causing tooth loss. Unfortunately, gum disease is a public health concern, as studies show that over half of all American adults have some form of gum disease. Read on as Drs. Jennifer and Cory Chambers of Cobblestone Park Family Dental explain how periodontal disease develops and how it is treated. Gum disease is often caused by poor oral hygiene habits. When food particles and bacteria are not removed from the mouth with regular brushing and flossing, a sticky film called plaque can form on the teeth, eventually hardening into tartar, which cannot be removed by brushing (only professional cleanings). As the bacterial cells multiply, infection results. The immune system’s response to this bacterial infection is to release substances that inflame and destroy the gum tissue and bone holding the teeth in place. In the early stages of gum disease, known as gingivitis, the gum tissue slowly deteriorates. The gums usually bleed and look swollen. 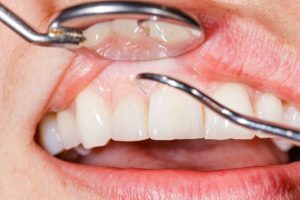 As periodontal disease advances, it can cause the gum tissue to pull away from the teeth, forming spaces or pockets that can harbor even more bacteria. In its most severe stages, called periodontitis, the tissue and bone that support the teeth are slowly destroyed. The teeth can start to loosen and shift around in the mouth, and the way the teeth fit together when biting down can change. The loss of tissue and bone can affect one area of the mouth or the entire mouth. It’s important to note that recent research has found a link between periodontal disease and systemic diseases, like heart disease and diabetes. Although more research is needed to determine the exact causal relationship, most dentists believe the bacteria responsible for gum disease can enter the bloodstream and possibly affect the heart, lungs and other organs. The exact treatment of gum disease depends on the severity of the condition. Mild forms of gum disease can usually be managed with a professional cleaning and diligent at-home oral hygiene. More advanced forms of gum disease may require procedures such as scaling and root planing, which remove bacteria and tartar from below the gumline and the root surfaces of the teeth. Antibiotic medicine may also be prescribed to help control the bacteria infection. The most severe cases of gum disease may require surgery to reduce gum pockets and place gum or bone grafts. If your gums are red, swollen or bleeding or you notice them pulling away from your teeth, you should be screened for gum disease. Please make an appointment with our team by calling or emailing us today.